Johnson Senyonga (L) joined by the Rubaga South MP Kato Lubwama at Parliament this morning. Photo by Vincent Kasozi. Johnson Muyanja Ssenyonga is the latest private Member of Parliament to file notice with Speaker Rebecca Kadaga in a bid to introduce a bill. In what appears as a move to stop the tabling of Igara West MP Raphael Magyezi motion seeking the removal of article 102 (b) in the Constitution, the Mukono South MP Muyanja Ssenyonga this afternoon presented a notice of motion for a private member’s bill on federal system of government. “The issue of federal which appeared since Constituency Assembly, up to date has never been considered. The purpose of this communication therefore is to take the honor and humbly request to allow me bring it on the floor of parliament,” reads MP Ssenyonga’s notice to Kadaga. 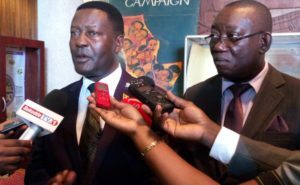 Speaking to journalists at Parliament, Ssenyonga said the federal system of government was highly supported during the Constituency Assembly with 65 percent of Ugandans in its support as reported by the 1992 Odoki Commission. He added that the only way to end power greed in the Country is through power sharing. MP Ssenyonga now joins a section of several other MPs who have continued to file notices with Speaker Kadaga in a bid to overwhelm her office and ensure that she sticks to her earlier ruling that government constitutes a constitutional review commission and comes up with an omnibus constitutional amendment bill. Some of the other MPs who have already filed motions include John Baptist Nambetsye, the Manjiya county Member of Parliament and his Kasambya counterpart Gaffa Mbwatekamwa who also seek leave of Parliament to introduce private member’s bills seeking to amend the Constitution. In his notice, MP Nambetsye wants the Constitution to be amended to require MPs, once appointed to a ministerial position, to relinquish their parliamentary seats while MP Mbwatekamwa, wants leave of Parliament to introduce a bill scrapping all academic restrictions in the Constitution for all elective offices. Also before Speaker Kadaga is a motion notice from Worker’s MP Sam Lyomoki seeking leave of Parliament to present the Museveni Succession, Transition and Immunities bill and a notice by Kassanda County MP Patrick Nsamba Oshabe to present a motion for the creation of a Constitutional Review Commission. All these motions were sparked off after the much anticipated notice supported by government by MP Raphael Magyezi to present a motion seeking to pave way for the amendment of Article 102 (b) of the constitution, which caps the presidential age at 75. Once approved, this would see President Museveni seek another term of office when his current term expires in 2021. Under the current provision, President Museveni, who was born in 1944, would not be eligible to contest for the presidency since he will be above 75 years of age. There was heightened tension in the House on Thursday when Parliament attempted to debate the motion prompting the deputy speaker, Jacob Oulanyah to differ the matter to a later date. Speaker Kadaga is expected to provide guidance on the matter and the fresh notices filed by the different legislators on Tuesday.